In impressive fashion, the No. 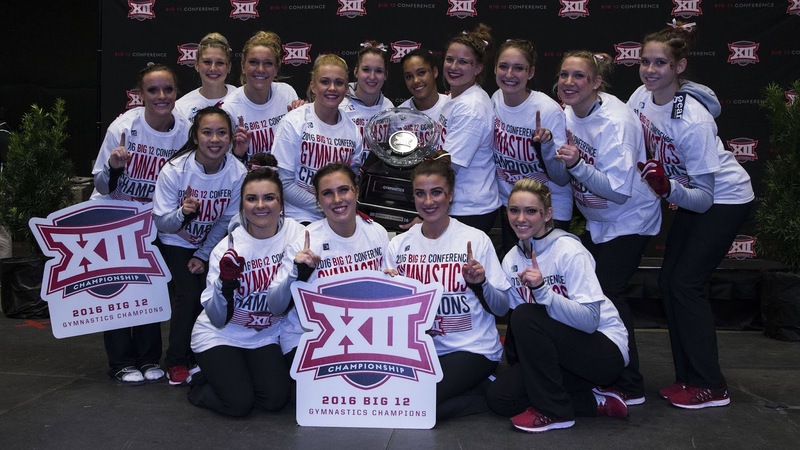 1 Oklahoma women’s gymnastics team snagged its fifth straight Big 12 title, securing the championship with a conference-meet-record 198.050. The event was held on Saturday inside Dr Pepper Arena. The Big 12 Conference title is the ninth in program history for OU and the eighth under 10th-year head coach K.J. Kindler. OU is the first team to ever win five consecutive Big 12 titles. Last year, the Sooners became the first squad in conference history to win a fourth straight crown. In its first season as a Big 12 affiliate, No. 10 Denver placed second with a 196.725. West Virginia took third with a total of 195.925, while Iowa State scored a 195.350 to finish fourth. The Sooners claimed individual conference titles on all four events, including the bars top honor following a perfect 10.0 from senior Keeley Kmieciak. The score was the first 10.0 of her career, and it was just the second in Big 12 Championship history and the first since 2001. Kmieciak and sophomore AJ Jackson tied on vault with scores of 9.925, the second straight title on the event for Jackson. On beam, sophomore Natalie Brown and junior Chayse Capps both earned scores of 9.95 to share the top of the podium. It was the second straight year Capps has shared the beam crown. For the third time in her career, senior Haley Scaman became a Big 12 champion on floor, doing so with a 9.95. She also earned top floor honors in 2013 and 2014. Junior Chayse Capps was the Big 12 all-around champion, scoring a 39.600 in her first season competing on all four events. “Chayse did an amazing job, obviously, but she’s been so steady all season," Kindler said. "This isn’t something I wouldn’t have expected her to do tonight because she’s just been a model of consistency for us." Following the conclusion of the meet, Big 12 yearly awards were announced as well. Capps was named the Co-Big 12 Gymnast of the Year along with Denver senior Nina McGee, while junior McKenzie Wofford was named the Event Specialist of the Year. Kindler was also recognized as the conference's coach of the year, marking the 10th Big 12 Coach of the Year honor of her career and seventh at Oklahoma. The Sooners began the meet on bars, where all six gymnasts scored at least a 9.9 and they tallied a massive 49.675. The score matched the program record OU set two weeks ago against Arizona. Kmieciak highlighted the rotation with 10.0, the fourth in program history on the apparatus, after earning a 10.0 from all four judges for her performance. In the anchor spot, Wofford added a big 9.95, her 11th score of at least a 9.9 this season, while Capps added a 9.925. Jackson got the Sooners rolling as she started the meet off with a bang, soaring to a career-high 9.9 in the leadoff position. In the No. 2 spot, freshman Nicole Lehrmann followed with a 9.9 of her own, and Scaman also contributed a 9.9 for OU. Denver and West Virginia opened the meet with scores of 49.100 on beam and floor, respectively, while Iowa State took a 48.850 on vault. After the rotation, the Sooners held a 0.0575 advantage over second place and never looked back. The Sooners carried their momentum to beam where they recorded a 49.475, their third-best total on the apparatus this season. Brown and Capps paced the Sooners on beam with identical 9.95s. It was a career high for Brown and marked the 11th straight meet in which Capps has scored at least a 9.9. Lehrmann matched her career best on the event with a 9.875, the sixth time in her freshman campaign she has posted the mark, while Kmieciak and Jones both added 9.85s. "On beam we had a couple of little mistakes, but they were minor and everybody held strong on that event. There were really exceptional routines from Keeley and Natalie and Chayse," Kindler said. OU remained in first place after two rotations with a 99.150. Denver stayed in second with a 98.400 after a 49.300 on floor. West Virginia held third after scoring a 48.800 to bring its total to 97.900, and Iowa State earned a 48.625 on bars to sit in fourth at 97.475. Led by Scaman’s 9.95 in the anchor spot, the Sooners recorded a 49.475 on floor. The meet marked the 12th time this season that Scaman has scored at least a 9.9 on the event. Brown and Capps added strong marks of 9.9 in the No. 1 and No. 2 spots, while Jones recorded a 9.875 and Jackson tallied a 9.85 for the Sooners. “Our bookends were great on floor," Kindler said. "Natalie Brown was amazing starting us off, and Haley Scaman was great closing the door." The Sooners used the rotation to move their advantage to 1.275 with a 148.625 total. Denver remained in second at 147.350 following a 48.950 vault score, West Virginia held third with a 146.975 (49.075 bars) and Iowa State sat in fourth with a 146.150 (48.675 beam). Kmieciak and Jackson shared top honors on vault after both recording 9.925s. Kmieciak also finished second with a 39.575 in her conference all-around debut. In the No. 2 spot on vault, senior Hunter Price matched her career high with a 9.9 in her first time competing at Big 12s, and Jones added a 9.85. Capps and Scaman both recorded totals of 9.825. The Sooners scored a 49.425 for the rotation, matching their third-best total of the season. Denver closed with a 49.375 on bars, West Virginia scored a 48.950 on beam and Iowa State closed the meet with a 49.200 on floor. Oklahoma, who has secured the No. 1 seed, will receive its regional assignment on Monday. The selection show will air live on NCAA.com at 3 p.m. CT. NCAA Regional competition is set for Saturday, April 2, at six campus sites around the country (Alabama, Georgia, Iowa, Michigan, Minnesota, Utah). The top two placing teams from each regional will advance to the 2016 NCAA Championships in Fort Worth, Texas, on April 15 and 16. "Timeless" is a word that's always used to describe your Team USA style. Take it to new heights with this Team USA Very Official National Governing Body T-shirt. It features printed team graphics and a tagless collar.